This one was kind of fun to fit the windows together. When I finished it, Emily took one look at the top and asked if she could have it when it was finished so this is “Em’s quilt”. 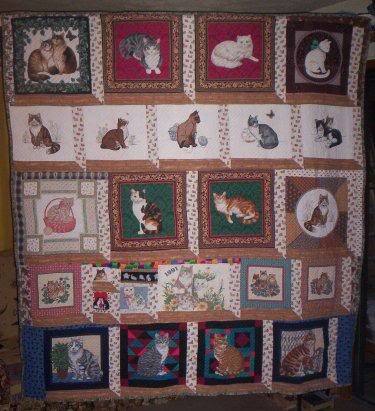 There are several prints that look a great deal like some of the cats we own or have owned so we have an “Alex” square and “Prissy” square among others. Attic Windows in non-uniform sizes with cat prints in the windows. Quilt by the piece: vertically on the uprights, horizontally on the sills and diagonally on the window panes. Title, signature and quote in window sills. 1″ binding in stonewall print.